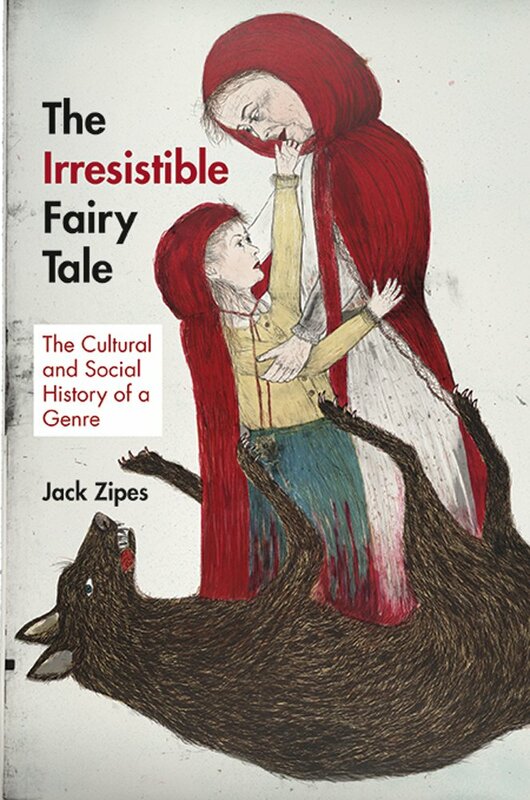 In one of his latest books, The Irresistable Fairy Tale (2012), Jack Zipes builds on what he discusses in his 2006 book, Why Fairy Tales Stick: The Evolution and Relevance of a Genre. I haven't read "Why Fairy Tales Stick" but the former is at my public library so I've gotten a chance to peruse it recently. 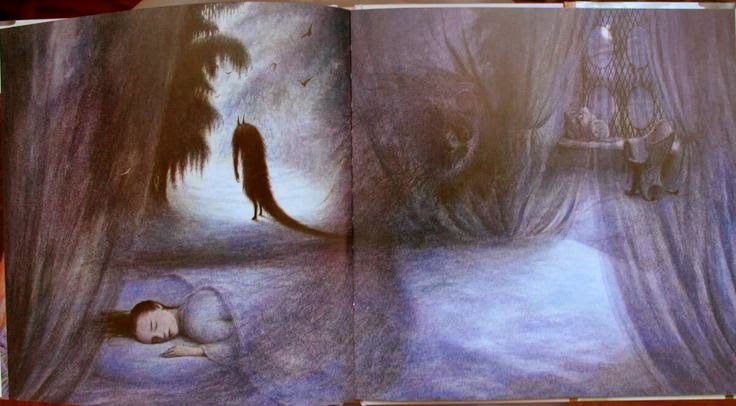 In both books, Zipes seeks to look into and answer the question of the undeniable long-term popularity of fairy tales. Although they have changed over the years, evolving and adapting according to each culture, fairy tales have managed to remain in public general knowledge and popularity for an impressive longevity. In fact, really the only other thing I can think of that compares to fairy tales in its universal human appeal over completely varied human cultures is religion. Zipes discusses the science of memetics, or to use a term most people are familiar with, "memes." Memes can be more than pictures of cats with funny captions-a meme is anything that captures the public imagination and spreads in popularity. Memes generally rise and fall over time, but fairy tales have stayed afloat for hundreds of years. What makes a meme stick with us is its relevancy. Therefore, general human consensus for most of known history would indicate that we find fairy tales relevant to our lives. Zipes points to the fact that fairy tales start in conflict, as do our real lives. Although I might point out that basically every story has some form of conflict, so there has to be some other common thread that indicates why fairy tales and not other literature remain so prevalent. However, tracing the history of fairy tales themselves is incredibly difficult. Zipes says, "Almost all endeavors by scholars to define the fairy tale as a genre have failed. Their failure is predictable because the genre is so volatile and fluid." Not only that, but he goes on to mention that the term "fairy tale" never existed until Madame d'Aulnoy coined it as the title of a book in 1697. Her collection of stories about fairies prompted a trend with far-reaching impact she could not have imagined at the time. For now we use the term to cover a multitude of stories, but most of them don't actually involve actual fairies. How did that specific term explode to cover the undefinable genre we now call fairy tale? 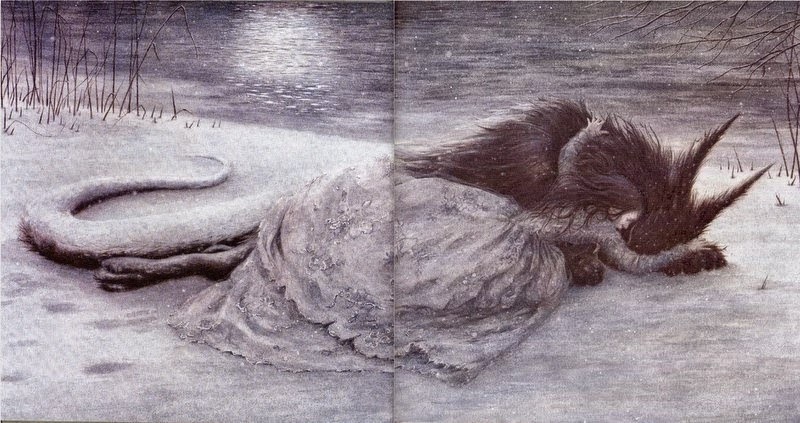 Although the French fairy tales were very influenced by the Italian collections of Straparola and Basile, those works were only self titled as "tales" and not necessarily associated with, or strongly featuring, fairies (although a few do make an appearance). 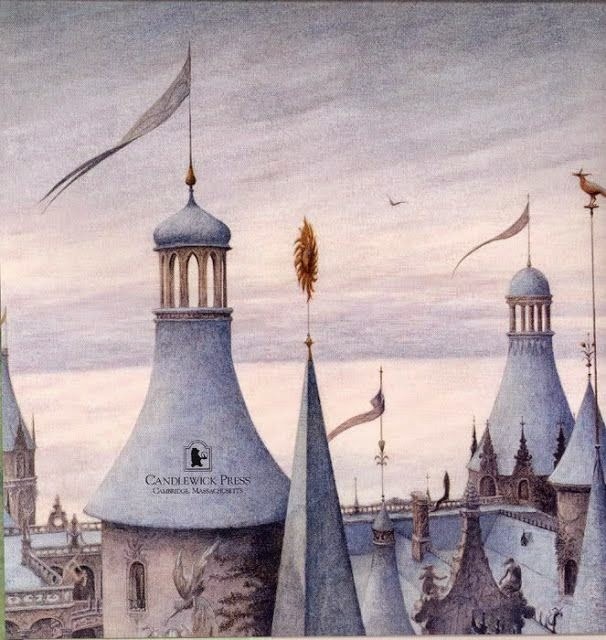 Yet D'Aulnoy made fairies central characters and put the word in the title of her book, creating an association between a term and a genre that are inseparable today. Why fairies, and why all of a sudden? And what was it about D'Aulnoy's newly coined "fairy tales" that made them so popular? D'Aulnoy lived in a time when women's rights were severely limited. She created a world of fiction in which human lives and destinies are governed by powerful female fairies-the fairies influence everything from fertility and birth, to arranging destinies and love. Some fairies are more evil and witch-like, others good and just, but they are all powerful and fearsome, and in control of the fate of humans. In a time when women had little to no power either in society or in the home, she created a world where women could vicariously live through fairies to have responsibility, supernatural powers, and control. D'Aulnoy and the other female writers who followed in her footsteps self-identified with the fairies and used them to create alternate ideals for society. 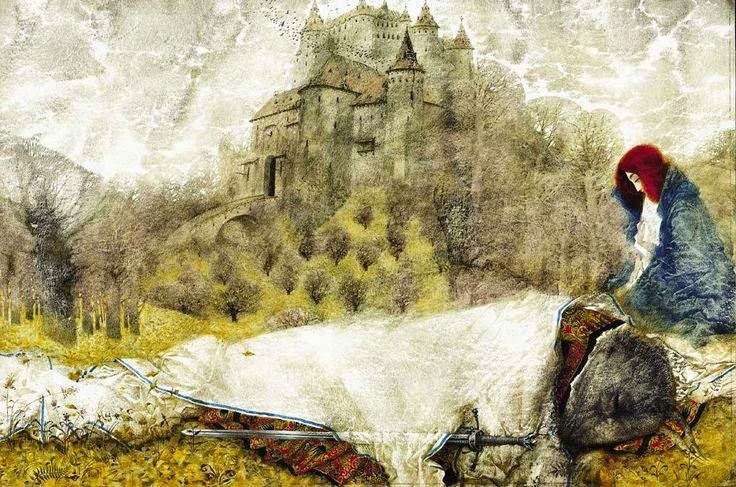 The human characters in the first official fairy tales turned not to government, or the church, to solve their problems-but to the fairies that were a throwback to old mythological dieties and goddesses. For the first French fairy tale writers, "the fairies in their tales signal their actual differences with male writers and resistance to the conditions under which they lived...it was only in a fairy-tale realm, not supervised by the church or subject to the dictates of King Louis XIV, that they could project alternatives stemming from their desires and needs." Any readers who live in England/will be travelling to the UK this spring? There's a unique fairy tale play going on, Philip Pullman's Grimm Tales for the Young and Old: An Immersive Fairy Tale, adapted and directed by Philip Wilson. 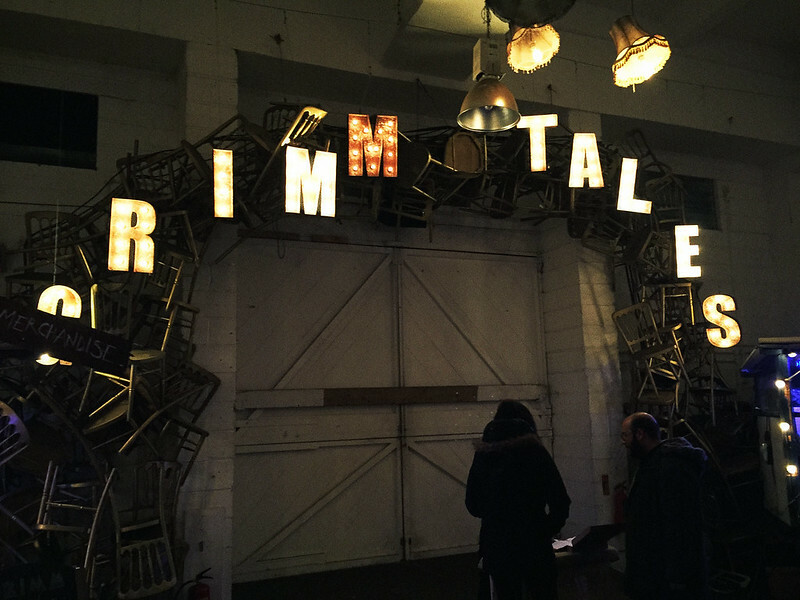 "This winter, Philip Pullman’s compelling Grimm Tales return in a brand new immersive storytelling experience that will plunge adults and children alike into the subversive world of the Brothers Grimm. "An enticingly foreboding shadow is descending over the sprawling Bargehouse, Oxo Tower Wharf on London’s South Bank. Here, these delightfully twisted tales, lovingly crafted and theatrically reimagined, will be brought to life before your very eyes. "Do you dare experience these infamous fairy tales, no longer bound to their pages but trailing your footsteps, breathing softly down your neck and unravelling in wonder before your eyes? From The Frog King to Hansel & Gretel, you’ll encounter some unforgettable characters from Philip Pullman’s book, in a deliciously dark winter experience full of unexpected twists and turns." 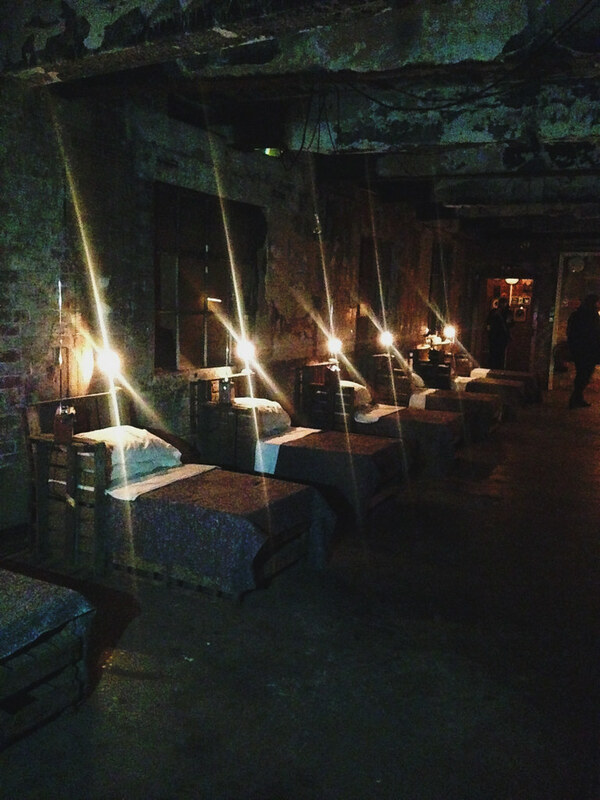 "When I saw this team’s previous production at Shoreditch Town Hall, I was thrilled with the vividness and fidelity with which they’d carried the tales from the page to the performance space. Imagination, wit, a mastery of all the theatrical possibilities of lighting and costume and make-up and the simple magic of transformation all combined in an experience that was a joy to encounter. I’m sure the venerable Brothers Grimm themselves, if they could see it, would be as delighted as I was." Reviewers seem overall very impressed with the play, especially the format. 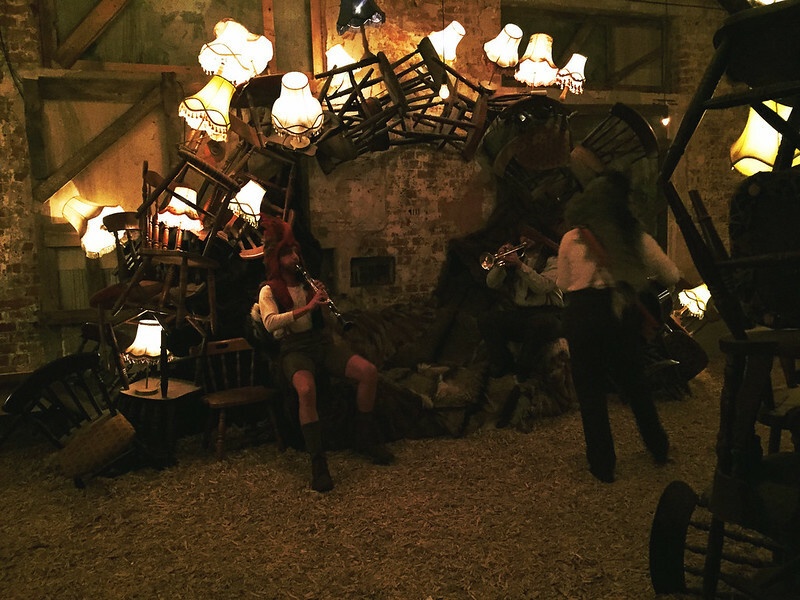 Instead of an audience sitting in chairs in an auditorium, they follow the characters through a large warehouse with different sections set up as each fairy tale. Props to the creators of this play for not only staying faithful to the Grimm fairy tales, but introducing audiences to lesser known tales, such as "Faithful Johannes" and "The Three Little Men in the Woods" (which seems to be the audience favorite). 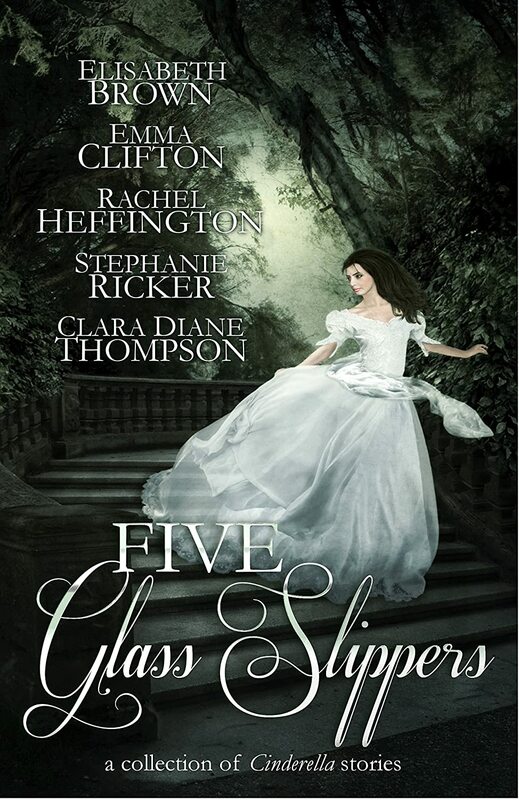 Published last year, Five Glass Slippers has received good reviews so far, averaging 4 out of 5 stars on Amazon and Goodreads. It's a collection of Cinderella-inspired short stories, but each with a different approach and with something for everyone. And it appears that the stories published were winners of a contest-mostly quite young and some never published before, yet readers seemed happy overall. One comment on Amazon I found interesting, and something we fairy tale lovers may come across, was a one star review titled "Who needs 5 rewrites of Cinderella-especially all in one collection?" "What happens when Cinderella is so painfully shy that she cannot bear the idea of attending the royal ball? Or when the slipper fits . . . but on the wrong girl? What happens when Cinderella is determined to oust an imposter prince from her rightful throne? Or when she is a cendrillon miner working from a space station orbiting a cthonian planet? What happens when Cinderella, a humble housemaid, is sent with a message for a prisoner trapped in a frightening fairy circus? Here is Cinderella as you have never met her before, wearing glass slippers and off on unforgettable adventures!" Alisandra is determined to have her rights. She knows that she is the king’s secretly dispossessed daughter, the true heir to the throne. Prince Auguste is an imposter, and if she plays her cards right, Alis will prove it to the world! That is, if charming Auguste doesn’t succeed in winning her heart before she gets her chance . "Oh! Beast, how you frightened me!" she cried. "I never knew how much I loved you till just now, when I feared I was too late to save your life." "Can you really love such an ugly creature as I am?" said the rich beast faintly. ... She answered softly, "Yes, dear Beast. "As she spoke a blaze of light sprang up before the windows of the castle; fireworks crackled and guns banged, and across the avenue of orange trees, in letters all made of fire-flies, was written: "Long live the prince and his Bride." The shadows are getting longer already and I have a special anniversary dinner planned with my Prince, so this will have to be our last stop on the tour, but it's a good one, I promise. K: Don't these doors look just enormous? G: The carving on these is gorgeous but they are intimidating. K: Wait till you see what's inside. Close your eyes for a minute. K: Good. 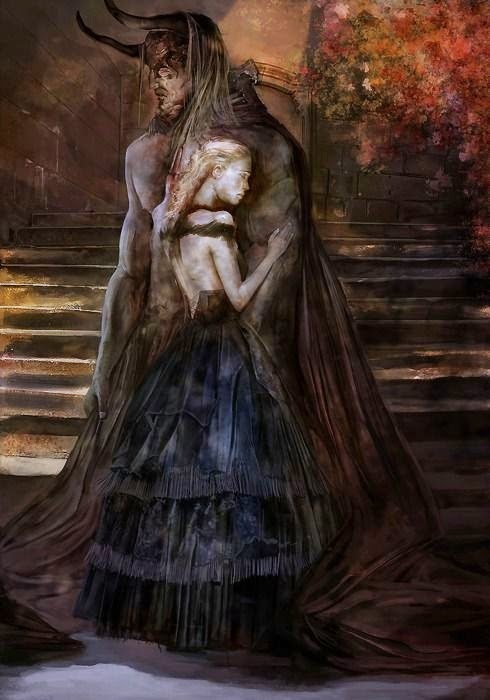 *whoosh of air then takes Gypsy's hand, guides her forward* Step this way, step, step, left a little, now stop. Ok -open. G: *blinks and gasps in astonishment* Oh you weren't kidding! This place is amazing! Look at your collections! OK, talk me through the goodies. What are your favorites here? K: Oh, there's so many! 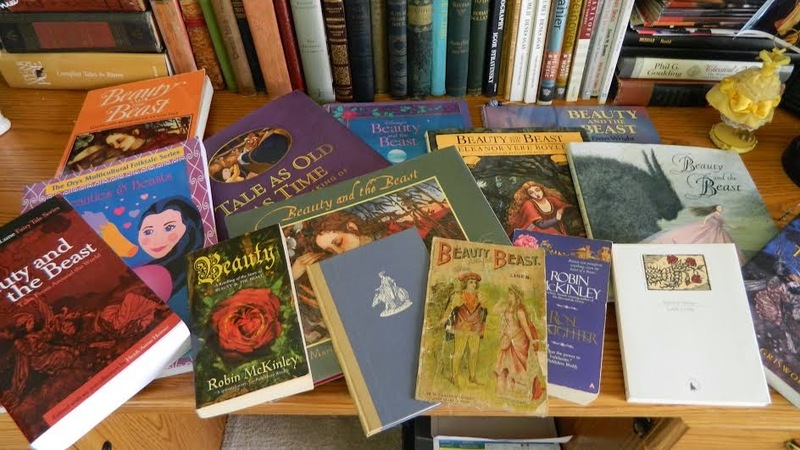 When it comes to Beauty and the Beast research, every scholar needs a copy of Betsey Hearne's Beauty and the Beast: Visions and Revisions of an Old Tale, and Jerry Griswold'sThe Meanings of Beauty and the Beast: A Handbook. G: Great choices. And is that a computer I see over by the window? K: Here is my Beauty and the Beast book collection: I have picture books by Friere Wright, Eleanor Vere Boyle, Marianna and Mercer Mayer, and my very favorite, Angela Barrett and Max Eilenberg. I have the SurLaLune collection as well as the Oryx Multicultural Folktale Series collection. Of course there are a couple Disney versions in there, including the "Making of" book by Charles Solomon. Some of my most unique books are the French text of Villeneuve's story (even though I'm not even close to fluent in French...), a copy of the Charles Lamb poem, and an old linen picture book from 1897. G: I just... *whispers* wow! If I come over again and disappear, you should probably look for me here first. G: Ah! You read my mind. *takes a grateful sip* So, apart from your Beauty and the Beast research, what are your other main go-to resources when you begin researching fairy tales home? 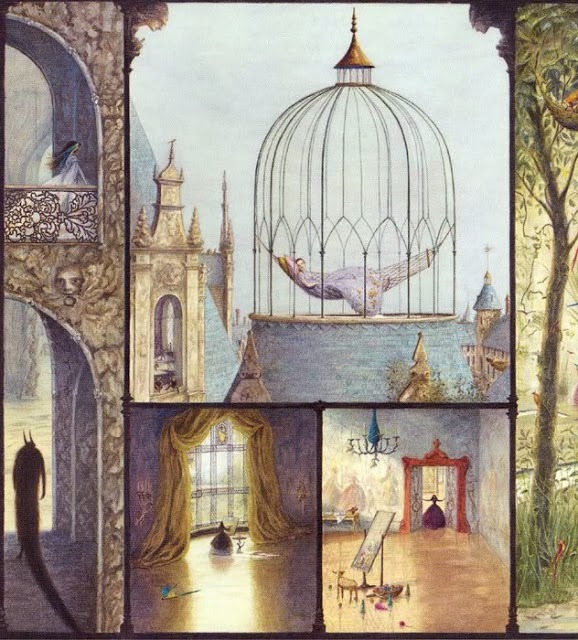 K: I also really love Marina Warner's From the Beast to the Blonde: Fairy Tales and their Tellers, really anything by Maria Tatar, and the whole series of SurLaLune's Tales from Around the World. G: Oh my. Time flies in this place! I'd better get back. And you have a dinner to get to! *gets to feet* Thank you SO much for the tour today. I feel so honored to have been brought into your beautiful, private fairy tale here. I love everything about it. K: *blushes* Thank you for coming. We should do this again some time. And soon. G: *jumps up and down with delight* Are you kidding me!! This is possibly my favorite thing yet! Where does that door lead to? K: *grinning* It's s shortcut to the front courtyard. Your horse is already there waiting for you. G: Oh wonderful, thank you! *quick hug* This has been the best day. It's your anniversary but I get all the presents! Thank you! K: You're welcome. Ride safe! 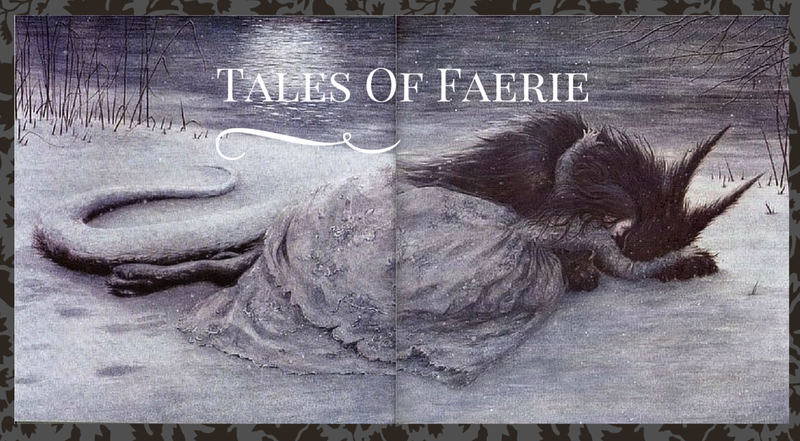 Thanks for stopping by, and I hope you enjoyed this little peek into Tales Of Faerie! I appreciate every one of your visits, your reading the blog and your comments. 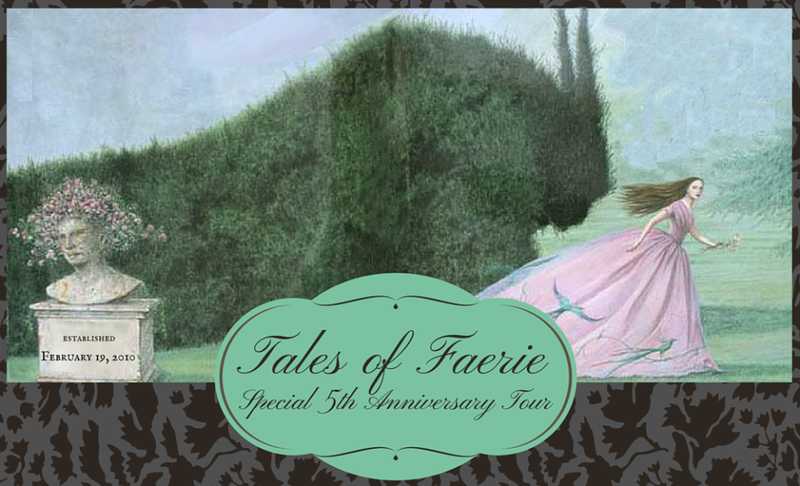 Tales Of Faerie has become so special and I've met so many amazing people because of it. What makes blogging so exciting is the opportunity not just for me to spout my own ideas, but to have conversations with all sorts of wonderful people and learn from you as well! Thank you for all your support over five years. I can't wait to see what the next five will bring. Catch you on the blog later! 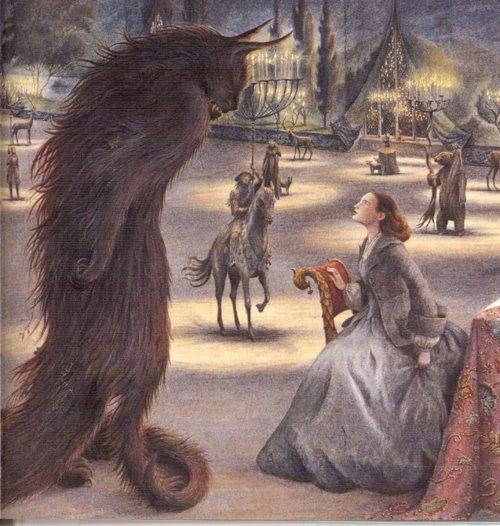 Note: All illustrations used, unless otherwise indicated, are from the picture book version of Beauty and the Beast, written by Max Eilenberg, Illustrated by the amazing Angela Barrett (2006). Received a letter via bluebird from Gypsy after she left. Many thanks to all of her hard work in making this tour happen! "This morning she decided to amuse herself in the garden, for the sun shone, and all the fountains were playing; but she was astonished to find that every place was familiar to her, and presently she came to the brook where the myrtle trees were growing where she had first met the prince in her dream, and that made her think more than ever that he must be kept a prisoner by the rich beast." Welcome back readers. I'm glad you're following along on the tour! Now that I'm dressed a little more practically for the outdoors, let's go get Gypsy and I'll show you all the grounds and gardens. K: *Calls through french doors* Gypsy? You there? G: *hurries outside* I'm so sorry. There are so many lovely paintings, I lost track of time. Those boots look amazing by the way. K: Thank you. I do like having an occasion to show them off and they are good for walking the grounds. *links arms with Gypsy* I have so much to show you. G: Is this a maze? And those little statues, wow - they all look like different versions I've seen of the Beast in different books! K: I do so love to be reminded of the different variations of my Beast. But just to clarify, I am not in any way calling my wonderful husband Tony a Beast...he is a true Prince Charming, in character and appearance! G: You are a lucky girl. 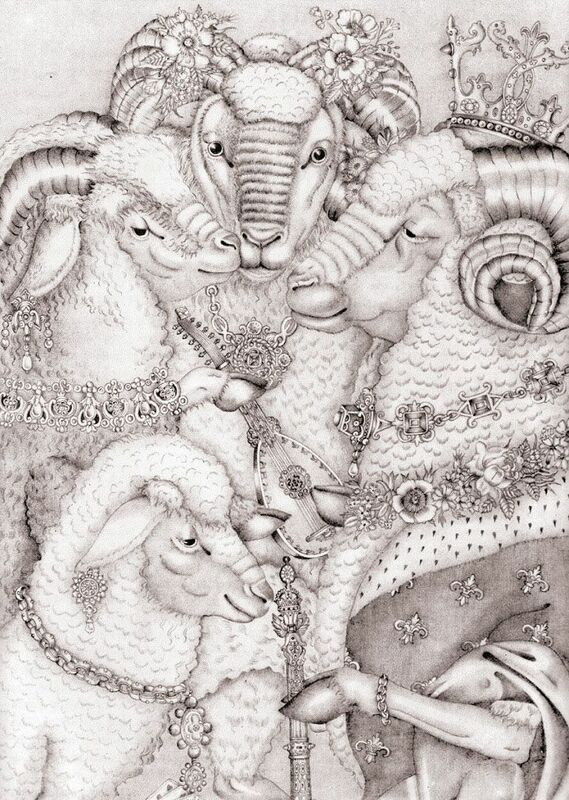 Beasts - and Princes - truly come in many forms. *touches pig-looking snout of a gargoyle thoughtfully* Speaking of variations, which versions of the Beauty and the Beast fairy tale are your favorites and can you tell me a little of how and why you came to love Villeneuve's version so much? K: One of my favorite things about it is how it answers so many of the questions people have about the fairy tale. 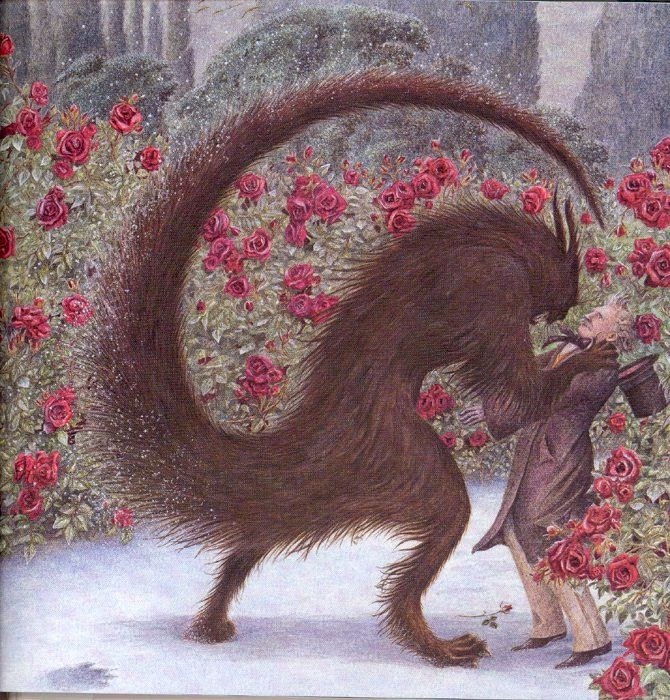 Why did the Beast get so upset about a stolen rose? 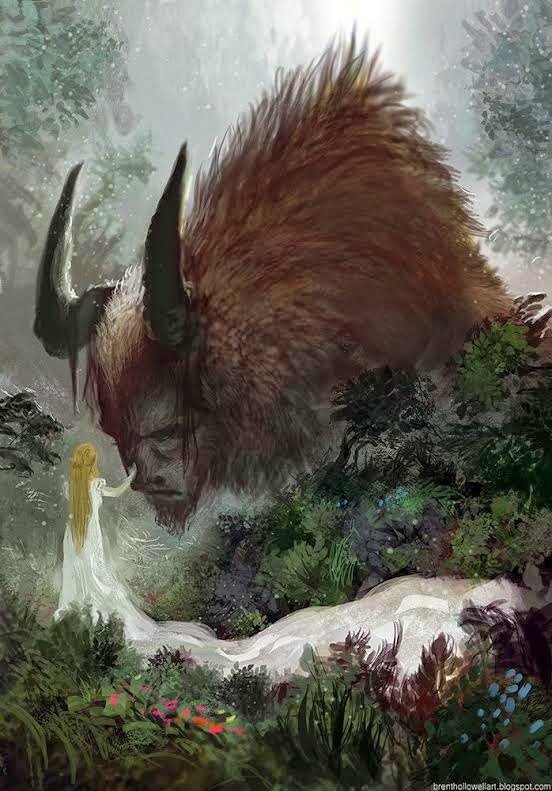 It's all in the Villeneuve story, as well as rich back stories for Beauty and the Beast that describe why the Beast was cursed in the first place, as well as a secret history of Beauty and the faerie folk most people aren't aware of! G: You wrote a post recently on roses in fairy tales - which appear often. Are there things you think you've learned as a direct result of their being part of the Beauty and the Beast tale? 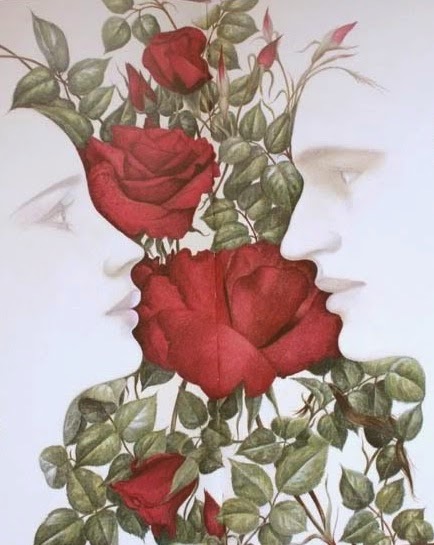 K: Roses can symbolize so many different things, even from version to version of the tale. Beauty's request for a rose was supposed to indicate her appreciation of nature over materialistic things. 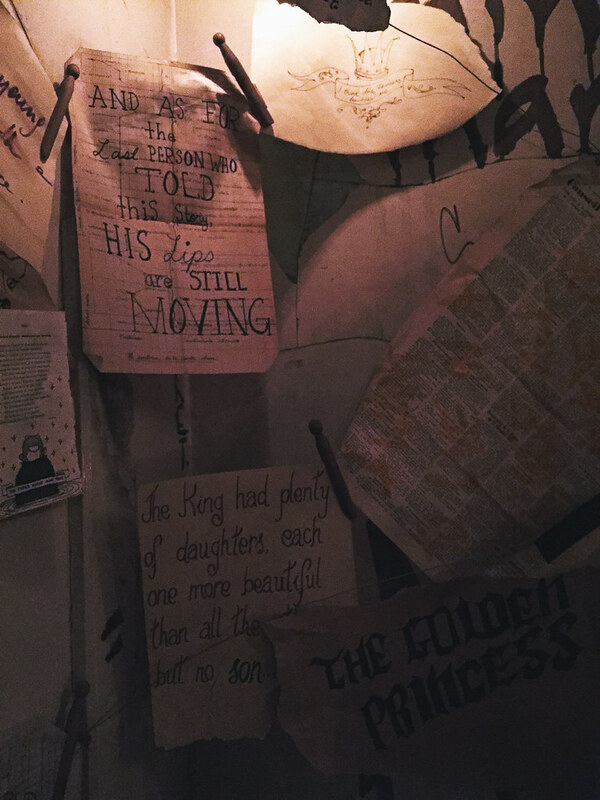 Yet in the Disney version, the rose is linked to the Beast's life and represents a ticking clock in which Belle has to break the spell, adding a heightened sense of tension. Roses are on the one hand simple, wild, and innocent, yet at the same time represent passion, romance, and luxurious decadence. They are multi-faceted, just like the tale itself! K: Well, obviously roses and a castle! Some of my favorite interpretations of the castle have a more eerie, almost creepy interpretation of the magic there, such as the disembodied hands holding torches in the Cocteau film. And of course one of those scenes would have to be a library, like the one Beast gifted Belle with in the Disney version! In fact, let's head in the direction of the Tales Of Faerie library now. We'll take the long way round so I can show you my favorite roses before we get there though. G: Ooh - yes please! K: We'll meet everyone else there around mid-afternoon, say 4 o'clock-ish? I've asked for coffee and refreshments to be waiting for us. "And after about an hour's talk Belle began to think that the rich beast was not nearly so terrible as she had supposed at first. Then he got up to leave her, and said in his gruff voice:"Do you love me, Belle? Will you marry me?" K: Welcome to Tales Of Faerie! I'm so glad you made it... except... you look a little pale. Is everything OK? G: *holding cloak tightly around self* Um, thank you. I, er, well - I was a little surprised to see your, extremely large and heavy gate open itself. I was just about to pull the bell but then when the torches on your garden path started lighting up one by one, like they wanted me to follow, but I couldn't see - or hear - anyone, and well, I got a little... nervous. K: Ah. That would be the servants. I'm so at home here now I forget how unnerving that can be! They don't have to be invisible anymore but they're shy around strangers. They don't mean any harm. G: *looks somewhat relieved, smiles and relaxes hands* I can deal with that... *gasps as cloak is whisked away to hang on a hook* Ahem. I think! G: Ok - that I could get definitely get used to. And that's Stravinsky's lovely ballet music I hear, correct? K: Yes. That's one of my favorite pieces ever. G: I love The Firebird Suite too. Should come as no surprise a music teacher would have beautiful music in her home. *looks around* What a lovely parlor! I have a feeling you do some of your writing here. K: Yes. Except for when I'm in my Library-..
K: *laughs* ... -which I will show you later. this is one of my thinking spots. I keep a few of my favorite things here to inspire me, like some of my favorite Beauty and the Beast mementos from childhood, and of course pictures of my husband Tony! G: *finishes sipping and puts glass down * This is like being in a another world here. I can see why you love it. K: Before you get too settled, I'd like to show you the grounds next, but I'll need something a little more practical for that. Not even the invisible servants can mange to stop these lace sleeves snagging in the gardens! Why don't you rest for a bit after your journey? I'll make sure your horse is fed and watered then, then when I've changed, I'll meet you just outside those doors, *points down corridor to double french doors*, say, in about an hour? You can view my gallery of some of my favorite Beauty and the Beast art that's on display in the hallway too. K: *smiles secret smile, whispers to air* Be back shortly! 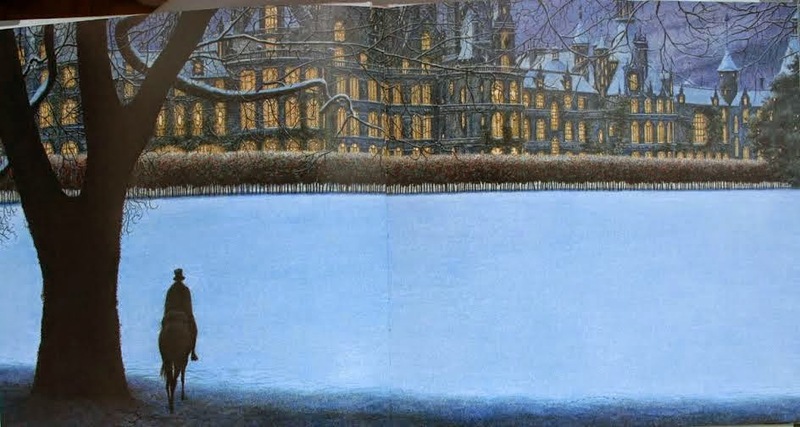 Note: All illustrations used, unless otherwise indicated, are from my favorite picture book version of Beauty and the Beast, written by Max Eilenberg, Illustrated by the amazing Angela Barrett (2006).